Hello everyone. I didn’t exactly set out to take a blogging break these past weeks, but I’ve been pretty unwell lately and that’s what ended up happening. Usually I put up a warning if I’m going to be quiet for a little while, but this time it was all unplanned and I couldn’t quite muster the energy to do so. I just kept telling myself I would come back the next day, and before I knew it twelve days had passed. I feel really bad that I missed a couple of blogging events I was excited about, and even more so that I dropped the ball when it comes to e-mail, comments, collaborative projects, and a couple of other miscellaneous blogging things I’d promised I’d do. All I can do is apologise and ask you to bear with me during these difficult times. First of all, the three recent Dodie Smith reissues from Corsair. I’ve already read one of them and hope to be able to tell you about it very soon. Gillepsie and I by Jane Harris: This caught my eye more than any of the other titles from this year’s Orange longlist, and I’m so happy to have the chance to read it. The Age of Wonder by Richard Holmes: The subtitle – How the romantic generation discovered the beauty and terror of Science – says it all. I’ve been dying to read this for years, and it seems like a great match for my current non-fiction kick. The Thirties and The Blitz by Juliet Gardiner: More exciting non-fiction that is very relevant to my interests. Finally, there’s Mariana by Monica Dickens – because who doesn’t need more Persephones? Part two of M’s master plan to motivate me to get better is even more exciting – he’s taking me to Paris for a weekend in July! I don’t know about you, but I find that having something big to look forward to in the not-so-distant future can do wonders for my everyday well-being. It works a bit like a gigantic carrot on a stick, encouraging me to cope with things, to get as well as I can, and to just carry on day after day. I realise a trip isn’t exactly a long-term solution to my troubles, but whatever helps, right? I haven’t been to Paris before, so this is particularly exciting for me. Paris has been on my mental must visit list for ages, but to be honest the city doesn’t loom as large in my imagination as places like London or New York, for the simple reason that I haven’t read anywhere near as many books set there. So I’d like to ask you for suggestions of books that would give me a real feel for the city, so I can put together a reading list for myself (A Moveable Feast is already on it, of course). I’d also be very grateful if those of you familiar with Paris could give me suggestions of places to visit. Again, I already have a few entries on my mental list, and I do plan on reading every guide I can get my hands on, but I tend to trust direct recommendations more than tourist guides. And since you’re all pretty familiar with my interests, I bet you could come up with some great ones. We’ll only have two days, so there will definitely have to be some difficult choices – what, besides Shakespeare and Company, should I make absolute sure I don’t miss? Last but not least (and I’m so sorry that this post is nothing but me asking you one favour after another), I’d love it if you told me what I missed while I was gone. Google Reader will have to get the “Mark All as Read” treatment, but I’d really appreciate it if you linked to any particularly interesting posts you wrote (or saw somewhere else) while I was away. Please don’t be shy – believe me when I say that I’d really appreciate the distraction. Oh Ana I am so sorry you haven't been well! I've been in lala land myself. Things have been posting (barely) but I have my hands full right now with my kids and particularly my daughter who is getting ready to graduate from 8th grade and move on to high school. I love that you have now been incented to heal...with a freaking TRIP TO PARIS!!! That is insanely exciting. I have never been, and will completely live vicariously through you. Besides the readathon last weekend and National Poetry Month, I'm not sure that you missed all that much. So glad to see your little self today! I'm sorry you've been unwell, and I'm glad to see you back. I can't really help you with Paris. I've been there when I was 13 or so, but back then my parents decided what to tour (I missed Shakespeare and co., but then again, I did not know about it back then). I wonder if perhaps there are some archives of the event "Paris in July", which had lots of bloggers read books set in France and Paris last year and the year before that? Wow! Your partner sounds like a keeper! Books and Paris in July sounds pretty darned awesome to me. Sandy: Thank you so much! I'll be okay even if it takes me a little while to get there :) I'm perpetually in awe of how much reading/posting you get done despite everything that's going on in your life. Your daughter is going to high school already! Time really flies. Marg: He really is :) I don't know what I'd do without him. And thank you! I'm sorry to hear you've not been well, but glad your partner is so excellent at cheering you up! I also acquired Gillespie and I recently, and I've been really looking forward to reading it. The Thirties is also a book that's been tempting me, so I'm very much looking forward to what you think. I loved Paris, although I had only 3 days there myself, and so I'm not full of recommendations as we did all the standard visits (Eiffel Tower, Versailles, Notre Dame, etc). One thing I can tell you I wished I'd planned better was eating, as we tried to improvise when we got there and didn't have any success at all, as we mainly paid too much for what wasn't fantastic. How exciting that you're going to Paris! I spent a week there about five years ago and have longed to go back ever since. If you don't have much time, I'd suggest the d'Orsay Museum over the Louvre -- the art is fantastic and it's much more manageable if you have a time crunch, plus it has all the Impressionists. I also found Notre Dame to have the best view of Paris, though the climb to the top is a killer, so start exercising if you're planning on doing all those steps! We stayed in a little hotel on a street called Rue du Cherche Midi, in the 6th arrondisment, between Blvd. Raspail and Blvd. du Montparnasse. There were great restaurants on our street and on Montparnasse as well. We had great meals almost every night! I think my favorite was on Monparnasse, called Restaurant Sud Ouest et Compagnie, which had the best cassoulet I've ever eaten. Might be a bit heavy for July but it was just wonderful. If you're looking for books about Paris, I can't recommend Zola highly enough. Many of his books take place there and though he wrote 20 books in Rougon Macquart cycle, they easily stand alone (and they don't need to be read in order). So far my favorites in Paris are La Bete Humaine and The Belly of Paris, which is all about the food markets in Les Halle. Pot Bouille was pretty good too. Sorry to hear you haven't been feeling well lately! I hope you're feeling much better now. I think a box of books is an effective way of cheering up any reader who's feeling down. :P And a trip to Paris sounds lovely. I've always wanted to go there (or anywhere in Europe) but I have no idea when it will happen. I'm sorry to see you haven't been well and hope it's not a chronic condition. It's been a while since I've been to Paris, but I love the Musee d'Orsay - I understand it's under renovation now, though. Of course you need to go to Shakespeare and Company and a visit to the Marche aux Puces is always fun. I loved Lunch in Paris but it's about living in Paris rather than visiting. It's probably lighter than what you're looking for. We'll always bear with you! I'm sorry to hear you haven't been feeling well. Your partner sounds fantastic, and Paris ought to be wonderful. On behalf of the homeland, have a ball. Aww, sorry to hear you've been unwell! Hope things are looking up for you. I also always find that having something to look forward to helps me stomach hard times more easily, so I hope the Paris trip will do that for you! As has been said before, your partner sounds like a keeper ;). Paris! Oh your guy is a sweetie! And yes to big carrots getting you through tough times! I was just telling my ex about how you haven't been able to find work - he was talking about the economic crisis and unemployment level in Spain now, and I said Portugal is just as bad. We are all watching and hoping things get better for you there, I hope you know. And for you in particular, Ana. So any thing new to look forward to is fabulous. Paris!!! I'm so excited for you! Hugs again and I hope you are feeling better soon. I'm sorry you haven't been well too! I've been in a mentally bad place, buy physically I'm still functioning (sort of!). Paris is wonderful! Well, it's hard to improve on A Moveable Feast for recommendations! I only have one blog post to offer you might have liked - I made the November Cakes from The Scorpio Races and posted about it last Sunday, with actual pictures of my unprofessional cooking efforts. And in my non-posting world, I've been reading books by Melina Marchetta and am in total love with her! I forgot to say that I really want to read Gillespie and I, I've had it out from the library but had too many others out too. It sounds so good, so I'm hoping to get it for my birthday next month. Several years ago we got to spend almost a month in Paris through a house swap. It was wonderful. I'm not going to recommend places to see since you have so few days. Instead, just see what you want to see. It's all wonderful in Paris. Even the bad neighborhoods were fun to visit. I will recommend two things. When you get there visis a newspaper stand and get a copy of Pariscope, a weekly magazine listing all the events in Paris. It comes out on Wednesdays and costs less than a Euro. We found a free sunset concert in Notre Dame listed in it and used the movie section all the time. I can't recommend going to the movies in Paris enough. It's wonderful. So much better than here in the states. And they love American movies and show them all with French subtitles. Pariscope is in French only, but it's easy enough to figure out what the listings are. It also includes galleries, museums, street markets, free events, etc. The only other must have is a book called Walking Paris by Gilles Desmons. YOU MUST BUY THIS BOOK. He has 30 walking tours, one for each district, with lots of fascinating history, gossip, etc. for all the sites along the way. Each tour starts and ends at a Metro station. We did four of the walks and they were our favorite activities. We found lots of wonderful, out of the way places in Desmons book that we came to love. Finally, the food is truly bad in Paris. At least at the amount of money we had to spend. The best thing to do is take a small lunch pail sized cooler and buy a thing of cheese and a bagette or two at the local market each morning when the bread is fresh, then just have lunch in a park. There are loads of little parks all over the city. Or, just ignore my advice and do what you want. You'll still have a fabulous time. I'm so sorry to hear you haven't been well, Ana, but your partner definitely sounds like a keeper. What a wonderful selection of books, and a trip to Paris is SO exciting! I've never been, but dream of a nice long stay. Loved reading James' comment above, too. Welcome back! I'm so sorry you haven't been feeling well and I really hope you are on the mend now. I am a big fan of Paris. I recommend the Jardin du Luxembourg for hanging out on nice days and the little streets in the area have wonderful cafes. Le Petit Palais is a good visit when the Musee d'Orsay queues are round the block. Plus a good guidebook will give you information about the small museums, particularly ones that used to be posh residences. Some of those are charming and nowhere near as busy or expensive as the famous ones. Really, it's a good city for walking in. As for books, The Dud Avocado by Elaine Dundy is a must. I'm also reading The Mandarins by Simone de Beauvoir at the moment and loving it - but you need time and patience for it, as it's 1,000 pages in my copy. I'm sure there must be lots of other great books... I'll return when they come to me! Freaking, Paris?! 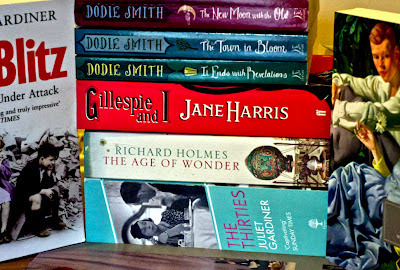 M is the best :) And those Dodie Smith books are so preeetty. Wants. Can't help you with Paris I'm afraid, but should you ever want to know about Nice drop me a line. What a great new haul of books and yay for PARIS! I hope all is ironing out for you and you're feeling much better. I would love every book in that box. In fact, I have already loved The Age of Wonder. Can't wait to see what you get from it. Have you Ever read any Louis Bayard books? I think my favorite Paris book of recent years was his novel The Black Tower (about "the lost dauphin" Louis-Charles and the Parisian detective Vidocq). It would be a good sick-bed read too! Well, I can't think of anything better than books and travel to fill me with a new zest for life and encourage me to get things done. Right now I'm using the sequel to A Discovery of Witches as my reward for once I finish rewriting the final chapter of my dissertation, and you already know Tony and I have our big trip to look forward to, which is what's working as my big motivator to push through these edits, face my fear of the oral defense, and just graduate already! I can't wait to hear about the Dodie Smith books, and I know you'll have a wonderful weekend in Paris. I haven't been for a while, but I highly recommend having a picnic in front of the Eiffel tower and wandering around the twisty, cobblestone lanes of Montmartre. Don't worry too much, it's pretty much impossible to have a lousy time in Paris! Sorry to hear you've not been feeling well but I'm glad to see you're back. :) And can I say so very jealous of your trip to Paris! We had a trip planned about two years ago and had to cancel but I'm looking forward to re-planning that trip. Unfortunately, all my sources are old so I don't think they'd be worth much but if I come across anything, I'll be happy to share. Enjoy the books and feel better. I can't imagine having any bad food in Paris, ever, anywhere. The cheapest places we went were creperies, and they were FABULOUS! Also I don't agree that Musee d'Orsay is better than the Louvre. It's good, though. If you go, have a meal or at least take a peek at the ceiling of the cafe. Oh, Ana, I know exactly how you feel. Don't worry about disappearing for a while, as long as you are starting to feel better. A trip to Paris sounds so lovely! I also know exactly what you mean about having something to look forward to. What a great guy! Yay for book sand Paris. Don't feel guilty about being a way. It happens to all of us. Hope you are feeling better. You are going to love, love Richard Holmes's Age of Wonder. It's awesome. I've read it three times. I want that Jane Harris book!!!!!! And don't feel guilty about not blogging. I don't know how people blog so much! LOL! I certainly am a bad blogger. Oh poor you! I'm sad that you have been unwell, and I hope you are entirely healed by now. I didn't know Dodie Smith's books were being reissued! The one I love is The New Moon with the Old -- the other two I can take or leave. Oh I really want The New Moon with the Old! I am getting right on this! Two things I didn't do in Paris but wish I had were visit the catacombs and go to the Bibliotheque Nationale de France. Oh, and you should go to the Musee Jacquemart-Andre, it's one of my favorite museums. But by far the best thing to do in Paris is just walk around. Strolling in Paris is one of the joys of life. As for restaurants, I'm not sure any of the ones I tried are still open. There are a lot of good, relatively cheap restaurants in the Latin Quarter behind the Pantheon that cater to students. So sorry to hear you've been unwell! :( But what a wonderful thing to look forward to -a trip to Paris!! I've been going to Paris every May/June these past 5 years & will be going this year, too. I'll send you an e-mail through your contact page later today or tomorrow with some tips. Meghan: The Thirties will probably take me a long while to get through (it's not often I find a book's length intimidating, but in this case, eep :P), but I promise to report back! Thank you so much for the tips about Paris. We'll probably skip Versailles this time, since I hear it takes a whole day to see it properly, but everything else is definitely on the plans! And I'll definitely do some planning when it comes to places to eat. Being vegetarian limits my options a little bit, to I tend to always make sure there will be places I can go to. Stu: Thank you! The new Persephone releases do sound very tempting - but then again, when do they not? Karen: Thank you so much for all the tips and recommendations! I've very excited to read The Belly of Paris - I looked it up and it sounds like an amazing read. There's actually a free version on Gutenberg, though I worry a little bit that the translation might not be the best. Chachic: Yes, if a box of exciting books didn't work I'm not sure WHAT would :P And I hear you on travelling - I have all these plans, but I haven't been in a financial position to make most of them happen. Someday! Kathy: Oh no, I hope Musee d'Orsay won't actually be closed! I was excited to visit that one. And I'll look up Lunch in Paris, as light isn't necessarily a bad thing! Susan: Thank you again for pointing me towards your excellent post on writing. And yes, things in Portugal are not much better than in Spain :\ But these times will pass, right? And meanwhile, I'm so thankful for the fact that Mathie has a job and that my family is incredibly supportive. So many people have it so much worse. Do treat yourself to Gillespie and I for your birthday! It sounds like such a great read. Jill: Aw, I'm so sorry to hear you've been in a bad place yourself :( Going over in a minute to see your post about the cake. And I've been meaning to read Jellicoe Road for ages! I bet you'll be the one to persuade me to drop everything and do it NOW. C.B. James: Thank you so much for this! I find it reassuring to think it's pretty much impossible not to find exciting things to see and do in Paris. I want to plan well because our time will be so limited, but I also want to leave room in the plans for spontaneity and random discoveries. I love your suggestion of lunch in the park - and in July the weather should be perfect for that! Finally, I'll definitely get my hands on that book. Thank you again! JoAnn: Thank you! I'm so grateful for James' and everyone else's excellent tips. I knew I could count on my fellow bloggers. litlove: Thank you so much for the recommendations! I was hoping to be able to see both the Louvre and the Musee d'Orsay, but I didn't count on the long queues! The smaller museums really sound like a good option in that case, especially because I want to make sure I get to spend lots of time outside just strolling around. Are you lending out that partner???? Thats such a goodish pile of reading. Enjoy them all. I'm glad to know you're okay now. We were worried about you here. Hm...I only spent a brief weekend in Paris and that was in 1999, so I don't have a whole lot to suggest, but if you have any way of getting to the Rodin museum, it's well worth it. I'm not a big fan of Rodin personally, but I am of Camille Claudel, his mistress and protege, and they have a huge collection of her work there as well. Yay for Paris! You'll have an amazing time! We went last year. We were there for 5 days, but we had three kids with us, so you'll probably see more than we did! :) One place we meant to go was the Opera House. I don't remember the exact name. We were staying with some people who were expats living there for a few years. They said that was one of their favorites and that it was amazing inside. Funny that someone mentioned the food be bad. We didn't find that to be the case. We must have been lucky when choosing the places we ate. The Cara Black mysteries, the latest by Christopher Moore, Sacre Bleu, and Chocolat, by Joanne Harris. Sorry to hear you haven't been well. I hope that you posting again means you are on the mend. Your partner is fab! New books! A weekend in Paris in July! I've never been to Paris so I can't help with recommendations on that front. I did just read A Tale of Two Cities by Charles Dickens which takes place in London and in Paris. Ups, I completely forgot the Paris tips in my first comment! Most of what I'd recommend has already been mentioned. If you're into contemporary art, you definitely shouldn't miss out on Centre Pompidou. I love that place. Last time I was in Paris on a leisure trip (because the last time I was actually there was sadly on business with no time for frolicking), I spent no less than four hours there and still didn't get through all of it. If my boyfriend hadn't dragged me out because he wanted to see "the rest of the city" as well, I would've spent even more time there! I'm so sorry to hear you haven't been feeling well. How sweet of your guy to work so hard at lifting your spirits - and with a trip to Paris even! Even though Paris is a city that nearly everyone seems to pine after, I've never been particularly interested in visiting it. BUT reading Anna & the French Kiss last year made me want to drop everything and visit that city asap. I'm sure your weekend away will be absolutely lovely. Ana, I hope you are feeling better! The box of books and a trip to Paris sound like good medicine! My only suggestion for things to check out are the posts for Once Upon A Time at Carl's website. Blessings! I am sorry that you haven't been well, but it sounds like you have an amazing partner who is doing some wonderful things to make you well again! Very nice new additions, and also Paris! Wow! Welcome back, and hope you feel better soon! As much as the Gardiner looks interesting, I don't envy you the number of pages it surely holds! Big stacks of books are always cheering. And a trip to Paris, how fun! I can't wait to hear how it goes for you--I'm planning one for the fall. I don't know of a book that will give you a feel for the city on the whole (London looms larger in my imagination too!) but Phantom of the Opera has made me desperately want to see the Paris Opera House! Sorry to know that you were unwell, Ana. Hope you are feeling better and you get back to normal cheerful self soon. Your partner got you the whole collection of Dodie Smith books? And he is taking you to Paris in July? Wow! He rocks! On books on Paris, I am giving below my favourites. Happy Reading! Hope you have a wonderful trip! Hi Ana, hope you're all better now! Very exciting about Paris. When we went we spent a lot of time in the St Germain area and I'm sure there were several bookstores there, as well as some cool restaurants. It was great! I'm afraid I haven't read much set in Paris either so can't help you there! Nothing quite perks up a rough time like a weekend in Paris! I'm so glad Shakespeare and Co. is already on your list (read "Time There Was Soft by Jeremny Mercer if you want some behind the scenes of the shop). I would also highly recommend going to see Sacre Coeur while you're there. It's an amazing white church, but you go up to it for the best view of the whole city, not really the church itself. It's just gorgeous. Have a fantastic time! As you may know I'm orginally from Paris so I'm happy to hear about anybody looking forward to go there. And btw the food in Paris is excellent. There are so many great places - it is one of the cities with the most restaurants in the world but tourits restaurants are very bad. Just try to go to side streets and something Vietnamese, Lebanese, Tunisian and you will eat very well. I reviewed a great book last year by an American writer in love with Paris who tracked down book settings in Paris he has a website, it's very nice. The movie Paris Je t'aime is great and far from clichéd. You might like it. All around the Bastille is very lively and they have many nice small restaurants. Be aware that coffee at the bar and inside the bistrot is cheaper that at the terrasse. It is a three prices system. The more inside, the cheaper. I hope this nice "carrot" will help you feel better soon. A box of books AND a trip to Paris! How wonderful! I'm sorry to hear you haven't been well Ana, really hope you feel your normal self soon. I agree that trips and holidays are always a great incentive to pick yourself up. I haven't been to Paris (other than Disneyland Paris) so can't really suggest anywhere to go, but really look forward to hearing all about it! You haven't missed much on my blog as I have been away too. A planned break though as I went on holiday to Tenerife (will have my pictures up this weekend if your interested). Just what the doctor ordered. Sorry to hear you haven't been well and as I am weeks behind in my Reader I am hoping I will soon catch up to your future posts and hear that you are doing much, much better. I love the idea of a carrot like Paris. I often find that looking forward to a fun trip will get me to feeling better and more positive about life. I make sure to always have a carrot on my schedule...ha! Oh Ana, I hope you get better soon. I'm just catching up on posts and have been rather crap about it. And near the Odeon metro, there's a cafe called Les Editeurs which is wonderful. Opposite that is a brasserie called Le Comptoir du Relais that does good food although you have to queue. And be sure to buy a crepe from a street vendor! And you must go and have a look at Shakespeare & Co which is just across from the Notre Dame.